During the summer of 2011, I spent a couple of weeks in the San Francisco Bay Area with my wife Annette. It was the end of a trip that had started in the north, in Seattle. From San Francisco, we went as far south as Paso Robles. As my daughter Katharina used to live in Berkeley until recently, I was a regular in the Bay area for many years. This list is the outgrowth of it. It also contains a number of places where I do not go for the wine, but the oysters. A San Francisco wine bar featuring carefully selected small production wines from all over the world. Not one of the 60 or so wines could be called a major brand. Gorgeous space – an old brick building opening into a lounge of a room with table, bar and sofa seating. Mainly a wine store. The wine list and selection of flights rotates regularly. Small bites like cheese and bread are also on the menu. I got there for the oysters: The Hog Island Oyster Bar offers indoor and outdoor tables with spectacular views of the bay. The oysters arrive fresh daily from Hog Island's oyster farm on Tomales Bay. Hotel Biron isn't actually a hotel; a small space on Rose Street, behind Zuni Café, with the ambiance of a well-appointed wine cellar. Biron serves up a nice list of wines and a short menu that includes a cheese plate and an olive mix. A gathering place north of the Panhandle, serving urban rustic food and specializing in organic wood-fired cuisine. With a large community table and bar. A second wine bar by the owner of Yield, just next to the Zuni Café. Like Yield, the focus is on “green” wine. RN74 is a San Francisco urban wine bar and restaurant featuring modern interpretations of refined American and regional French cuisine with an extensive wine list highlighting the Burgundy region of France. The Slanted Door is a Vietnamese restaurant that blends Vietnamese cooking technique with local ingredients. Relaxed atmosphere; Riesling-driven wine list. A fine dining restaurant. As a German and lover of German Riesling, of particular note is the outstanding selection of over 160 German Rieslings. They pair beautifully with Chef Sullivan’s house made charcuterie. As a minus, I am a fan of the dry Rieslings; Spruce offers not more than a handful of those. The wine list is dominated by sweet German Rieslings. Opened in 1912, Swan's is essentially a fish market with a long marble bar and 20 stools. You'll have to wait in line for a while to get in, but it's worth it. Yield is a small, intimate wine bar located in the heart of San Francisco's historic Dogpatch Neighborhood serving only “green” wines. Zuni Cafe always has a large selection of oysters. An oyster menu lists the species and the place name of each oyster in meticulous detail. Tuesday-Saturday 11:30 a.m.-midnight, Sunday 11 a.m.-11 p.m.
With a production of about 5000 cases, Dominio IV is one of the smaller wineries in Oregon. It is family run by: Leigh Bartholomew - vineyard manager and owner; husband Patrick Reuter – winemaker and owner; and parents Liz and Glenn Bartholomew - vineyard owners. The winery is based in McMinnville, south of Portland, while the estate vineyard is in the Columbia Gorge, east of Portland, near The Dalles. Earlier this year, on my California, Oregon and Washington State tour, we started out in the morning in Walla Walla in Washington State, drove by – but unfortunately did not have the time to stop – Dominio IV’s blab la vineyard in the Gorge and arrived just in time for a winery tour and tasting in McMinnville, south of Portland, Oregon. About two-thirds of Oregon’s wineries and vineyards are in the Willamette Valley. Buffered from Pacific storms on the west by the Coast Range, the valley follows the Willamette River north to south for more than a hundred miles from the Columbia River near Portland to just south of Eugene. But Oregon is not only about Willamette Valley. Oregon’s vineyards span the whole State, rising up and falling over the rolling hills and gentle valleys of more than 12,000 acres (4,858 hectares) of wine grapes. 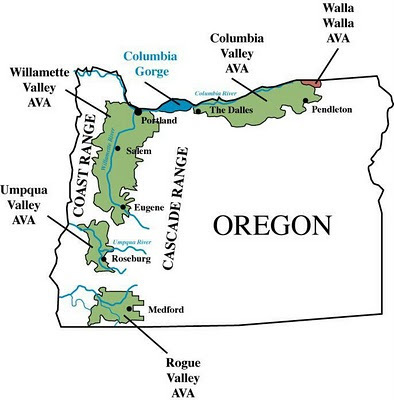 Oregon’s major wine regions are the Willamette Valley, Rogue Valley, Umpqua Valley, and the Columbia Gorge. Some regions straddle the border between Oregon and the States of Washington and Idaho. Oregon produces wine on a much smaller scale than its southern neighbor California. Oregon's biggest producer ships only 125,000 cases per year and most produce under 35,000 cases. The State features many small wineries which produce less than 5,000 cases per year. In contrast, E & J Gallo Winery, the US’ largest winery, produces about 70 million cases annually. The majority of wineries in Oregon operate their own vineyards, although some purchase grapes on the market. The husband and wife team Leigh and Patrick are the driving forces behind the winery, supported by Leigh’s parents Liz and Glenn. Leigh is in charge of the Dominio IV vineyards, but her main job is to be vineyard manager and co - general manager for Archery Summit, a producer of ultra-premium Pinot Noirs in Oregon. Leigh studied viticulture at the University of California at Davis and joined the team at Archery Summit in 2000. Patrick also studied at the University of California at Davis and is the winemaker of Dominio IV. The estate vineyard is owned by Leigh’s parents Liz and Glenn; Glenn is retired from the US army. The winery is based in McMinnville, south of Portland, while the estate vineyard is in the Columbia Gorge, east of Portland, near The Dalles. “We grow most of our grapes ourselves in Mosier, Oregon to ensure that they are cultivated with biodynamic techniques that don't just sustain, but strengthen, the land. What we don't grow, we contract from sustainable wine growers in Oregon who share our farming values” said Patrick. Dominio IV started farming biodynamically in 2001. “Biodynamic farming meets the organic standard including the prohibition of chemical fertilizers, pesticides, herbicides and fungicides, but goes much further. The integration of animals and animal feeds, perennial plants, flowers and trees, water features, and composting is emphasized. Three Sleeps Vineyard is one of a handful of Oregon sites to attain Biodynamic certification by Demeter” explained Patrick. The vineyard is planted to Tempranillo, Syrah, and Viognier. Dominio IV also makes Pinot Noir from fruit purchased from the Willamette Valley of Oregon. The Dominio IV winery resides in the thriving Granary District of McMinnville, Oregon. What was once a dilapidated, agricultural storage building has since been renovated into the perfect home for creating and enjoying wines. They tore away the interior facades from previous remodels to reveal original walls composed of beautiful, local lumbers. Stacked, rough-cut two-by-eights glow with a natural warmth that makes the tasting room cozy and intimate: the ideal space to share stories and learn from Patrick or other pourers. Beyond aesthetics, the winery's old woods provide insulation for the actual production of the Dominio IV wines. “Steady conditions ensure that in our processing, pressing, and storing rooms, we can accurately develop the best wines possible. Even the 250 oak casks, stacked like looming monuments, in our barrel room benefit from such constancy” said Patrick. Dominio is Latin for a feast or banquet, and power or strength. It is also Spanish for territory or dominion. “The IV refers to four people, four wines, four seasons and four vineyards of Dominio Wines” said Patrick. The 4 wines from Dominio Wines are Pinot Noir, Tempranillo, Syrah and Viognier. “Like our every changing moods, we present four wines for your pleasure. Each one entangles you in its own character. Tempranillo is often like the mathematician who sits in his forest lair, contemplative, complicated, and rich in conjecture. Syrah is the spice; she is the dance, and an evening of dangerous possibilities. Viognier is the evangelist announcing the benefits of a diet based solely on fruit and flower. And Pinot Noir is the amazement of a card trick, it is the feeling of a bath, it is magic at the ends of the fingertips” Patrick explained. 2008 Dominio IV Tempranillo/Syrah Blend “the technicolor bat"
The back label says: “By day, the Technicolor Bat waits while hawks and eagles take flight over the vineyard by day. With wings of licorice and brown sugar and eyes that glow spiced cinnamon and chocolate, this Bat is made to fly by night. Grown on a gentle east facing slope: Tempranillo (80%) Syrah (20%)”. 2007 Dominio IV Syrah/Tempranillo Blend "Spellbound"
Syrah 58% and Temprenillo 42%. 2006 Dominio IV Tempranillo "Sketches of Spain"
There is a red wine revolution going on in Germany. Of course, given its location, the red wines of Germany tend to be not like the fruity red wines we know from warmer countries, but lean and more elegant, with a lot of finesse. 30 years ago, in the international scene, people would not talk about German red wine. But this has changed. Germany now produces red wines that can compete with the best of the world. The share of red wines in terms of production has increased from 10 percent in the 1980s to about 35 percent now in Germany. Against this background, the German Wine Society (DC Chapter) organized a red wine tasting earlier this year. I could not make it for the tasting but was very much involved in the preparation of it. Interestingly, the German Wine Society Tasting in Washington DC took place at about the same time as the now famous Tim Atkin Tasting in London, where German red wines put on an extremely strong performance. Sponsored by the German Wine Institute (Deutsches Wein Institut), Tim Atkin organized a Pinot Noir tasting in London in October 2011, at 7 of the top 13 wines of the 40 Pinot Noirs from around the world were German Spaetburgunder wines. This tasting has a good chance of becoming a miles post in the ongoing process of international recognition of Germany as a producer of premium red wines. The tasting in Washington DC was organized and led by German Wine Society member by Michael Fritze, who gave the tasting the title “Rapturous Reds”. Mike and I spent some time during the summer meticulously researching candidates for this tasting. To come up with a sensible list of wines was not easy. Many wine stores in Washington do not carry any German red wine. Who drinks German red wine? Others do carry German red wines, but these were the red wines that did not meet our standards in the pre-tastings. Finally, we had to be budget conscious. All in all, there were perhaps another 6 wines available in the Washington DC market that were not in included in the tasting for one of the two reasons above. Here are the wines presented at the tasting. This very old red variety probably originated in, and derives its name from, Tirol, where it is known as Schiava (Italy) and Vernatsch (Austria). A large yielder that ripens very late, it produces fragrant, fruity, light wines with a pronounced acidity. We were very proud to be able to include a Trollinger in the tasting; it was the only Trollinger we came across in our research. And it was a NV wine. But not bad, easy drinking, light. In Germany, the Spätburgunder is to red wine what the Riesling is to white wine: the cream of the crop. In fact, Germany is the world's third largest producer of Pinot Noir. The German name for the grape is Spätburgunder - late (spät) ripening pinot (burgunder). Today, Germany is the third biggest producer of Pinot Noir (called Spaetburgunder in Germany), after France and the US, with more planted than Australia and New Zealand combined. However, despite being the world’s third largest producer of Pinot Noir, the country exports just over 1% of its production. Picture: Christian G.E. Schiller with August Kesseler in Assmannshausen, one of Germany's Pinot Noir stars. Frankly, I think this was quite an impressive collection of German Spaetburgunder wines, which included a number of big names when it comes to German red wine. A prolific, relatively early ripener, Dornfelder produces wine far deeper in color than is typical of German reds. Three reasonably priced Dornfelder wines which showed very well what Dornfelder is able to achieve. Finally, Michael Fritze, at the suggestion of the German Wine Society (DC Chapter) Board, included a Dornfelder from Virginia in the tasting. Mike prepared a very nice Power Point Presentation for the evening. In addition to a lot of background information on German red wine, he prepared for each wine a separate sheet. 3 names came to mind, when I heard this - Randall Grahm, Nicolas Quille and Steven Sealock. I met all three of them earlier this year, at different places and different times. Randall Grahm created Pacific Rim in the 1990s and recently sold it. Nicolas Quille has been the head winemaker of Pacific Rim Riesling for a decade or so. He is based in Postland Oregon, while the winery is in South East Washington State, near Walla Walla. Finally, Steven is the resident winemaker at Pacific Rim; he showed me around and introduced me to the new wines, when I visited Pacific Rim during the summer of 2011. Pacific Rim produces 160,000 cases of wine now, almost all of which is Riesling made from Washington grapes (Grahm stopped using German grapes in 2008). That means only Chateau Ste. Michelle and Hogue Cellars make more Riesling in Washington. Pacific Rim produces 190,000 cases of wine now, almost all of which is Riesling. That means only Chateau Ste. Michelle and Hogue Cellars make more Riesling in Washington. Today, Pacific Rim makes 10 different Rieslings, as well as a Chenin Blanc, Gewürztraminer, raspberry dessert wine and two blends. It is owned by the Banfi family from New York. First released by Randall Grahm in 1992, Pacific Rim Dry Riesling quickly gained a loyal following among Riesling lovers. Known for its fresh and bright characteristics, the wine was a welcome alternative to other wines available in the American market. Today, Pacific Rim makes 10 different Rieslings, as well as a Chenin Blanc, Gewürztraminer, raspberry dessert wine and two blends. One of the wine world’s true iconoclasts, Randall Grahm, founded Pacific Rim. The owner of famed Bonny Doon Vineyard in Santa Cruz in California started his Pacific Rim project in 1992. Unusually, he used grapes from Washington State and from Germany. By 2006, Randall Grahm’s decided to downsize and reorganize. Randall sold his popular Cardinal Zin and Big House brands and started to spin off his Pacific Rim wines as a standalone winery in Washington State, where the US Riesling grapes came from. He worked with the Den Hoed family, longtime grape growers in the Yakima Valley, to create a winemaking facility in the shadow of Red Mountain. The DenHoeds built the building, which they own and lease to Pacific Rim. This year, Pacific Rim has been purchased by the Banfi family, which owns an important wine import company in New York and a famous winery and vineyard in Italy. I met Randall recently in San Francisco while I was there to see Richard Wagner’s Ring der Nibelungen at the San Francisco Opera. Randall was accompanied by his wife and his daughter. His wife is Japanese and this explains there is a Geisha on the Pacific Rim label. Nicolas joined Randall Grahm’s Bonny Doon Vineyard in Santa Cruz as General Manager in 2004 and initially managed the whole company, including Pacific Rim, but then focused on coordinating the spin-off of Pacific Rim and eventual sale to the Banfi family in 2010. He is now the General Manager and Winemaker for Pacific Rim winery. Nicolas came to the United States in 1997 and worked for J. Lohr and The Hogue Cellars. During his time at Hogue Cellars, he went back to school and earned a MBA from the University of Washington. Nicolas Quille was born in Lyon, France, from a family in the wine business for three generations. He holds a Master degree in Winemaking from the University of Dijon, Burgundy and a Master in Wine Business from the University of Reims, Champagne. Prior to coming to the United States in 1997, he worked in Burgundy and the Rhone Valley as a winemaker. I met Nicolas at the 1. Oregon Pinot Gris Symposium in Hillsboro near Portland (OR), where the headquarters of Pacific Rim is. We had lunch together and talked a lot about Pacific Rim. Steven Sealock is the resident winemaker at Pacific Rim in Washington State. Steven told me that “as an Air Force brat, I lived in Germany for several years. Combine this with a German mother and you can begin to understand why Riesling has a special place in my heart. To me, Riesling and German beer is a normal accompaniment to a filling meal. So I jumped at the chance to work here at Pacific Rim, a great company dedicated to making world class Riesling.” Steven started his career in the wine industry at Columbia Winery. On the magic Island of Madagascar there is now a growing number of fine lodges, which offer lodging in the paradise with world class food. One of them is Princesse Bora Lodge on Ile Sainte Marie off the east coast of the Grand Ile de Madagascar. There are 2 things that are very particular about Princesse Bora Lodge, as far as I am concerned. First, it is a good place for whale watching during July to September, when the whales migrate from the Antarctica and arrive in Malagasy waters to give birth and to mate. Second, Princesse Bora Lodge has a good selection of wines, but does not have a wine card; you go - with or without the Sommelier - into the wine cellar and you select your bottle(s) of wine there. Il Sainte Marie is a beautiful, unspoiled island that lies in the lee of Madagascar’s east coast. Protected by coral reefs from the sharks that patrol these waters, the long narrow island is a haven of pristine beaches and has seen little in way of development. Ile Sainte Marie is just paradise. You can go there by boat or by plane. Ile Sainte Marie is about a 50 minute flight from Antananarivo. Princesse Bora Lodge is owned and run by the Swiss/Malagasy Francoise-Xavier Mayer, whose ancestors arrived in Madagascar in 1825. Francoise-Xavier was born in Madagascar, but left the country with his parents during the period of the “Socialism Malagasy” (in the 1960s and 1970s), when the enterprise of his parents was nationalized. His family was a big player in the rice sector. Built in the Sainte-Marienne tradition of local stone, wood and thatch, the beautiful villas lie at the edge of a lagoon. Each villa has a wide veranda with chairs and hammock, and direct access to the beach. The beds are king sized with Mosquito nets so you can open the windows for air and light. The gardens are immaculately maintained and still keep that wild exotic feeling. The main building is a series of wooden houses interconnected with walkways. There are lots of things to do...or you can do nothing at all. I recommend a day or afternoon trip to Ile aux Nattes on your own: grab a bike from the hotel (free), then cycle to the little beach where guys will take you into their pirogues with the bike in their boat to Ile aux Nattes and then discover the inside of that tiny island and its beautiful shores. Princesse Bora Lodge also has a spa - the jungle spa. There are various relaxing spa treatments available from well trained therapists. There is a beautiful infinity pool with a large deck with very comfortable beach chairs and umbrellas. On the beach, there are palapas with back rests and cushions. There is also a sea swimming pool off the long pier. The resort has all kinds of water gear for use for free. July to September is a very busy period for Princesse Bora, when people from all over the world come here to watch the whales. The whales migrate from the Antarctica and arrive in Malagasy waters between July and September. They come here to give birth and to mate, and remain in the protected channel for four months until their calves have grown big enough to return to the waters of the South Pole. Guests can whale-watch from the lodge or from boats (to get closer to the whales). Francois-Xavier is the founder of Megaptera, an international association for whale protection. I have never seen the whales in Madagascar, but in Hermanus in South Africa; it is breathtaking. Sakafo is the Malagsy word for food. Generally, the Sakafo in Madagascar is very good. You can dine in its capital Antananarivo and other Malagasy towns like in France, but at much, much lower prices. Before becoming a sovereign country again in 1960, Madagascar was a French colony for over 60 years. The food in Madagascar is thus French-Malagasy. French food in Madagascar ranges from basic bistro food to one star Michelin food. I have written on Malagasy food and restaurants: Wining and Dining in Antananarivo, the Capital of Madagascar – Schiller’s Private List of Restaurants in Antananarivo, Madagascar and Schiller’s List of Restaurants in Antananarivo that Serve Malagasy Wine - Madagascar on schiller-wine. Salade folle a la Sainte marienne ou Terrine de foie gras; my wife Annette and I both chose the foie gras. Cuisse de canard confite aux thyms frais de l’ile ou La grillade du jour: Brochette de merou a la papaya verte, Riz safrane, fondant de poireaux; we both chose the brochette. When it came to ordering the wine, the sommelier informed us that there was no written wine card at the Princesse Bora restaurant. But there is a very interesting wine cellar adjacent to the restaurant and the sommelier invited us down there and instructed us how to proceed. The wine cellar - underground, temperature-controlled and totaling about 40 wines - consists of 5 sections. Unusual for a top restaurant in Madagascar, the selection is very broad and not so much focused on French wines. First, there are about 10 different wines from South Africa, with an average price of Ariary 55.000. Second, there is the same number of Latin American wines, on average a little bit more expensive. Third, there are about 10 different wines from France on average at Ariary 150.000. Forth, Princesse Bora does not carry any traditional Malagasy wine, but the new star on the Malagasy wine scene, Clos Nomena, rouge, blanc, rose, for Ariary 60.000. I have recently benefited from a tasting at the house of the owner of Clos Nomena in Antanananarivo and have posted about it: Clos Nomena: Taking the Wine of Madagascar to New Heights Finally, the wine cellar is complemented by a range of Champagnes. Here is how it works: Whenever you are up to, you just go down to the cellar and look at the wines available. When you have made your choice, you put the bottle on the table in the center of the cellar. The Sommelier keeps an eye on the table and brings the bottle to your table and serves the wine.